Girls arm and shoulder cherry blossom flowers tattoo with a butterfly that looks like stained glass art. 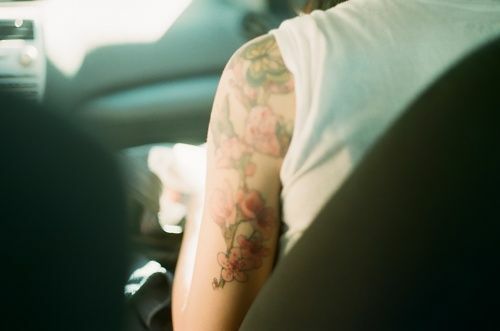 This cherry blossom tattoo has gorgeous cherry blossom flowers blooming off a green stem on the back of a girl’s arm. A fluttering yellow, blue, and green butterfly is placed at the top on a flower on her shoulder. The cherry blossoms were inked in a mix of pinks and white with little black dots. This tattoo looks more like a piece of art from a Tiffany’s stained glass collection than traditional Japanese or Chinese art. This unique look and vibrant colors really catch the eye.